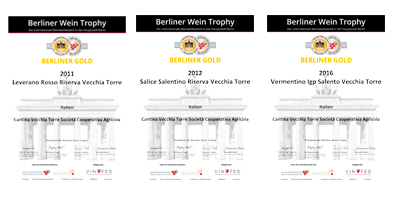 After the two Gold Medals obtained by our wines in the previous edition, the Cantina Vecchia Torre proves itself to be the Ambassador of Salento in the world, winning three Gold Medals at the last edition of the Berliner Wein Trophy. The competition, created in 2004, has become one of the biggest wine tasting events in the world. An international jury of experts tasted and selected more than 5,000 wines, of which less than a third can aspire to gain recognition. In fact, on the basis of the restrictive lines guides imposed by the OIV (International Organization of Vine and Wine) and the strict taste tests, less than 30% of the products presented obtain an award and our wines, passed this careful selection, have won three Gold Medals. Our selected wines are Vermentino 2016 IGP Salento, Salice Salentino Riserva 2012 and Leverano Rosso Riserva 2011, that represented the Salento in Berlin and awarded this well-deserved recognition.